Everybody says it - get professional photos! My own photos are decent, so I have a hard time convincing myself that the expense is warranted. But I must admit that the new photos of my work from the famed Robert Diamante really do have that extra zing. So I thought I'd take the time to examine my photos vs. his to see what I might learn. 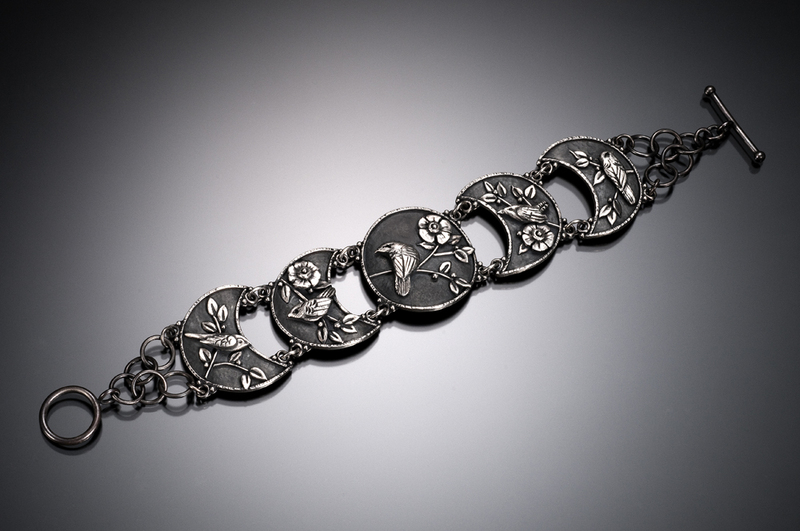 Here's the fancy new shot of my favorite bracelet, Five Moons, shot on a gradation background (but reduced in size). Here's my original photo, cropped to 1000x200px. And here it is again, shot by Robert and cropped to 1000x200px. Let's examine the differences, shall we? First, Robert angled the bracelet in his shot to make the bracelet as large as possible. To be fair, I took images at an angle as well, but also straight on because it fits better everywhere I use it. So I rotated and cropped Robert's image. Unfortunately, it retains the feel of a bracelet shot at an angle. So I learned that if I want a straight on image, I better ask for one up front. His photo is thus reserved for jury and publication shots where the angle is appropriate. The second noticeable difference is the color. Robert's image is seriously black and white, not the sepia tone in my original version. That's something that I can address with better lighting and/or color correction in Photoshop. I spent a few minutes on the computer and got this improved quality. The saturation isn't quite as good, but at least I'm learning what to look for in my own photography. Of course, there are details of Robert's photos that I can't reproduce as easily. For example, the higher resolution and optical quality of his camera and lenses. I have a nice Nikon digital SLR and an expensive macro lens, but no where near the investment that a professional would put into equipment. The lighting is also noticeably different. I have a very low investment system of daylight lights and tent, which is adequate but not outstanding. And most importantly, I don't have the eye and experience to always shoot every piece at the best angle or with the most exciting presentation. Those are the things that I pay for in a professional photo session. But... I can't afford that for every piece, so I try to improve my own photography for everyday use. I enjoyed reading about your comparisons of the photo techniques and conclusions. Thank you.